Today in Masonic History Burl Icle Ivanhoe Ives passes away in 1995. Burl Icle Ivanhoe Ives was an American musician and folk artist. Ives was born near Hunt City in Jasper County, Illinois June 14th, 1909. As a young man Ives with active with both the Boy Scouts of America and the Order of DeMolay. In 1924, Ives was a Lone Scout which shortly after would join with the Boy Scouts of America. On September 5th, 1927, Ives joined the Order of DeMolay. Ives attended Eastern Illinois State Teachers College from 1927 to 1929. He would not graduate. During his junior year he was in an English class and realized that he was wasting his time. After an exchange with the teacher as he was walking out the door, Ives slammed the door and never looked back. In the 1930's, Ives traveled around the country working odd jobs and playing his banjo. In Utah he would be arrested for vagrancy and for singing "Foggy Dew" an English-Irish folk song that local authorities considered a "bawdy song". He would also attend Julliard in New York during this time. In the 1940's, Ives would become start his own radio show called the The Wayfaring Stranger, named after one of his songs. He would also become a member of the Almanac Singers which at various points in time had other well known members including Woody Guthrie. The Almanacs were active with the American Peace Mobilization (APM). The APM was a peace movement trying to convince the United States to not get involved with World War II with various folk songs. When the Germans invaded the Soviet Union the Almanacs changed their tune, literally. They began writing folk songs encouraging American participation in the war. In 1942, Ives was drafted and ended up being part of Irving Berlin's This is the Army. A traveling show to military bases to help to rally and support the troops. He would be honorably discharged in 1943. In the 1950's, like many performers, Ives would be blacklisted for allegedly having communist ties during the Red Scare. Ives would appear before the House Committee on Un-American Activities. This would get him off the blacklist and get him into a long time feud with fellow folk singer Pete Seeger. Seeger accused Ives of naming names. In the late 1950's and into the 1960's Ives would appear in several films. He would appear in the film Big Country for which he would win an Academy Award for Best Supporting Actor. 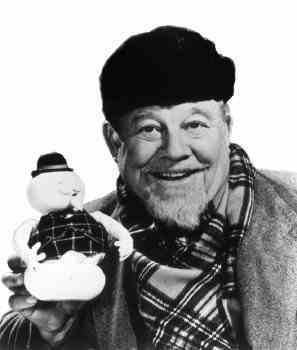 In 1964, Ives would appear in the CBS presentation of Rudolph the Red Nosed Reindeer. The stop animation show featured Ives as the banjo playing host of the show Sam the Snowman. Two of the songs that Ives performed in the show, "Silver and Gold" and "A Holly Jolly Christmas", were instant classics. The following year Ives recorded them for an album. He released them the next Christmas taking advantage of their previous success. Through the 70's and into the 80's, Ives would perform in various ways. He would lend his recognizable voice and face to a Luzianne tea as their commercial spokesperson. He would also do work with the U.S. Bureau of Land Management on their campaign "This is your land - Let's keep it clean". In 1994, Ives, a smoker of pipes and cigars, was diagnosed with oral cancer. After undergoing several surgeries that were unsuccessful in removing the disease, Ives decided to stop any future surgeries. On April 14th, 1995, Ives fell into a coma and passed away. Ives was a member of Magnolia (now Magnolia-La Cumbre) Lodge No. 242 in Santa Barbara, California being raised in 1977. He was also a member of the Scottish Rite, Southern Masonic Jurisdiction in the Valley of Santa Barbara in 1985. Ives would be coronated a 33° Scottish Rite Mason in 1987. He would be elected a Grand Cross, an honorarium added to the 33° in 1993.